Given the rarity of opera companies in the states these days, there are some pieces of the the canon that devotees may only see once or twice in their lifetime, if that. As last week's North American premiere of the 296-year old Amadigi di Gaula shows, there's a lot of incredible work that never makes it around. 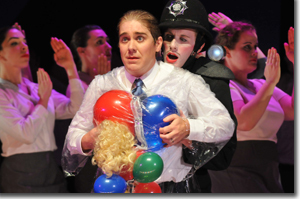 For the third and final production of its 79th season, Central City Opera serves up a wonderful desert, as varied in its delights as Neopolitan ice cream: three delectable divertissements, in three different languages—Italian, German, and French. To these diverse stories, director/choreographer Ken Cazan brings a unifying vision that revolves around the maintenance of home and identity in the face of cataclysmic events. Among the many subjects ripe for rueful comedy, an extended family's bickering over a rich relative's behest has got to be near the top of the list. 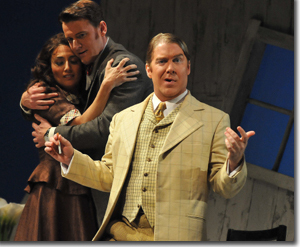 Giacomo Puccini, with a tart libretto by Giovacchino Forzano, covers all the bases in one hour. Rinuccio and Lauretta are in love, but his family will not let him marry, because she has no dowry. When Rinuccio's rich uncle, Buoso Donati, dies, the family is horrified to learn that his will assigns the entire fortune to a monastery. Schemes are quickly hatched and a local fixer, the clever Gianni Schicchi, is called in to satisfy the varied self-interests with a plot twist worthy of O. Henry. With Puccini's lush score supporting a variety of excellent vocal performances, bolstered by a steady stream of wonderfully comedic stage business (kudos to Cazan for his virtuosity in these details as well as his additions before the music begins and after it ends), this ranks as one of the premiere productions you're ever likely to see of this confection. Too funny! Perhaps, if the Church had conscripted Kurt Weill (music) and Bertolt Brecht (lyrics) to teach its far-flung flock about how to deal with temptation in the course of their every day lives, it might have been more successful in avoiding the widespread hyprocrisy that follows wherever it goes. Weill and Brecht's modern psychological drama—the main character is represented by two women, one "practical" (the singer and narrator) and one "pretty" (the dancer)—follows the journey of Anna (I: Peabody Southwell and II: Sarah Tallman) to seven different cities in her quest for employment and self discovery, hoping to save enough money to fulfill her family's directive to return to rural Louisiana and build a home. Along the way, Anna must come to terms with each of the seven deadly sins—Sloth, Pride, Wrath, Gluttony, Lust, Greed, and Envy—in surprising ways. Southwell's voice and Tallman's expressive dance (with Cazan's connective choreography) are an intriguing combination. World War II had more influence on changing societal dynamics than was readily apparent in its immediate aftermath, as women returned to domestic life from the factories and were expected to unquestioningly take up domestic duties. But within a generation, it was clear that women's liberation was here to stay. In this post-modern take on masculine-feminine role shifting, Francis Poulenc (music) and Guillaume Apollinaire (libretto) use surrealism and hyperbole to accentuate the desperate emotional straights of those left standing after World War II; yet, their questions—on sexism, war, and population—remain just as topical today. Central City Opera's production of three one-act operas, Puccini's Gianni Schicchi, Kurt Weill's The Seven Deadly Sins and Francis Poulenc's The Breasts of Tiresias, runs through August 3rd (The Seven Deadly Sins) and 5th (Gianni Schicchi and The Breasts of Tiresias), in repertory with Händel's Amadigi di Gaula and Bizet's Carmen. 303-292-6700 or centralcityopera.org.